As soil management influences crop quality, agriculture can be linked directly to human health. Nutrition provides plants and animals with the resources for growth, health and development. The food we eat does the same for us. In 1992 the USDA published a report of its findings on diet and estimated that 500,000 lives a year could be saved simply by getting the Nation to eat the lowest Recommended Daily Allowance (RDA) of vitamins, minerals and energy. The first Step towards managing a living soil is to undertake a comprehensive soil analysis. It is important to evaluate the level of availability of major and micro-nutrients, cation exchange capacity and base saturation, before making any decisions relating to the soil or the crop. The aim must be to identify any deficiencies, excesses or antagonisms within the soil complex. Taking a soil sample provides the opportunity to take a close look at the structure of the soil, find soil pans, check on the decomposition of crop residues and see how far roots have to go to find moisture. Cultivation is a primary tool for soil management. Compaction layers should be broken up and materials such as humates added to the soil to stop the layers re-forming. Ploughing can be a useful means of controlling weeds and producing a clean seedbed, but care should be taken not to plough deeper than 18 to 24cms. If a soil balancing programme is to used, it is important not to bring sub-soils up into the top 18cms of soil. On thin soils over chalk, and heavy clays, the depth of top soil can be increased by managing organic matter. Setaside, straw incorporation, cover crops and fertility building leys can all be used to achieve this. Choice of fertiliser will influence the biology and chemistry of the soil. Applications of soluble nitrogen and phosphate can serious restrict the activity of beneficial microbes. Once the microbes have switched off, increasing amounts of NPK will be needed to maintain crop growth, as the contribution from the soil declines. Products like muriate of potash can have detrimental effects on soil pH, nutrient availability and the activity of soil microbes. Lime applications should never be made unless base saturation and cation exchange have been measured, as excess calcium can greatly reduce nutrient availability. In most soils, there is sufficient phosphate, magnesium and potassium to last for hundreds of years. This soil reserve is locked away and only becomes available in response to roots and microbes. Sometimes, there simply is not enough available material to support the crop, and fertiliser applications have to be made. In these situations, simple fertiliser forms, combined with humic acids or bio-stimulants, will support soil fertility and crop growth. Trials with arable crops and pasture have shown that good yields can be obtained from soils over a thirty year period, without using NPK fertilisers. Levels of available nutrients have actually increased over this time, despite extractive cropping, and soil tests show very little change in nutrient reserves. When poor decomposition of crop residues, or slow release of nutrient reserves is a problem, applications of live microbes may be required. Microbial populations change with each season and crop, and may not have the right food source or conditions for growth. Managing the soil to provide a habitat for beneficial microbes will result in better, healthier plant growth. 1. Use a comprehensive soil analysis to identify the limiting factors, and potentials, within each field. 2. Make soil improvements as necessary, to correct any deficiencies, excesses or structural problems. 3. Stimulate soil organisms to build fertility - get microbes to feed and protect the plant. 4. Reduce or omit conventional Phosphate and Potash fertilisers - let the soil reserves provide this. 5. Select the most appropriate Nitrogen source to meet the needs of the soil-crop combination. 6. Reduce or omit crop protection chemicals - use nutrition and ecology to maintain health. The concept of Eco-Farming, or ecological agriculture, has been promoted by Acres USA for decades. Eco-Farmers rely on being able to manage and maintain a fertile soil. This requires an understanding of the physical, chemical and biological factors that influence fertility. But Eco-Farming goes beyond soil management. Setting it right in the soil - getting the soil to feed the plant - will give better yields from lower inputs, improve the nutritional quality of the end product and influence the health and well-being of those that eat it. The Eco-Farm system can make a significant contribution to the crisis facing modern agriculture - to the benefit of the farmer, the consumer and the environment. This is the 2nd part of the paper which was presented by NEIL FULLER at the Acres USA Conference, "Blueprint for Eco-Farming", St. Louis, Missouri in 1997. 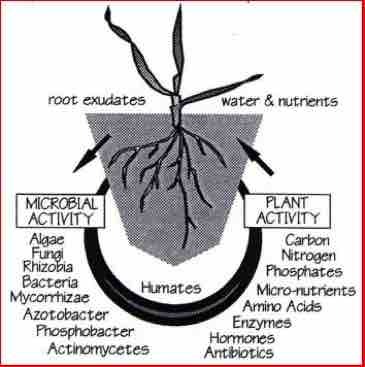 The diagram shows a close-up of a plant root hair, with two types of beneficial microbe. The first is a bacteria known as Rhizobia, which infect root cells and form nodules. These nodules contain the enzyme ferrodoxin which traps nitrogen from the air. This nitrogen, which can reach levels of 250 kg/ha/year, is released into the soil as the nodules begin to decompose. 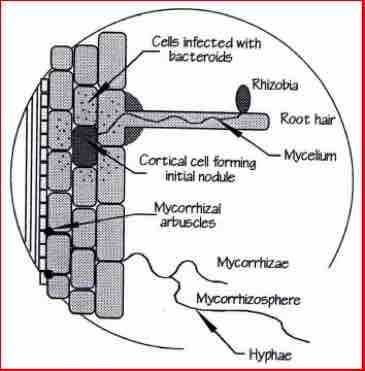 The second group of microbes are Mycorrhizae, which live within root cells and send thread-like hyphae out into the soil. These hyphae create a myco-rhizosphere that is active in releasing minerals from the soil and transporting them to the root. Mycorrhizae can increase root surface area by upto 100,000 times and actively transport nutrients to the plant from upto 40mm away. The level of nutrition that a plant can access not only places limits on growth, but also affects health and disease resistance. Foliar pathogens use exo-enzymes to break down leaf tissue, enter cells and feed on the plant. To combat this, the plant has a number of defences. Physical defences include a layer of wax on the leaf surface, and the strong binding material, lignin. Silica and calcium are used to maintain cell structure, keep layers of cells bound together and prevent pathogen invasion. The next defences are chemical. Copper and zinc are used to make phenols and phyto-alexins, which have anti- ungal properties. Manganese is used to build enzyme inhibitors, blocking the pathogen's own chemical attack capability. If nutrient levels are low, manganese will be taken away from other plant functions, such as photosynthesis, causing further stress on the plant. An additional defence comes from beneficial microbes in the root zone, which stimulate phenol production and transfer products such as streptomycin to the plant. The disease will interrupt normal plant functioning and cause amino-acids and sugars to move from cells to the pathogen. Pathogens target plants which can provide them with suitable nutrition, notably nitrogen in the form of aminyl-nitrate. Feeding the plant with different types of nitrogen fertiliser can influence pathogen activity. Plants with a high sugar content (brix) have more energy and soluble minerals that can be mobilised for defence. Over fifty years ago Weston Price and Sir Robert MacHarrison published detailed studies on the impact of diet on human health. Since then, agriculture has adopted increasingly artificial methods of production, and food quality in terms of mineral and vitamin content has declined. The foundation of this decline lies in soil management, by ignoring the fact that soil fertility is a biological rather than a chemical function, plants and animals suffer nutritional imbalances that limit their health, growth and performance. Comparing organic and conventional methods, below, shows the difference in yield and mineral content of wheat. The organic crop takes up far more nutrition than the conventional crop, which will be passed on to those the eat the grain, provided it is processed carefully.